The remarkable Traveller HD from Optelec seamlessly fills the gap between large desktop video magnifiers and smaller hand-held devices, hereby creating a new category on the low vision market. Large enough to provide intuitive and comfortable reading, yet small enough to fold, pack and take along. Optelec, U.S. has launched the Traveller HD, a video magnifier with a novel design hereby creating a new product category on the low vision market. Combining elements never before seen in a portable video magnifier, the Traveller HD integrates a unique Slide & Read mechanism that allows for an effortless, natural and more intuitive reading experience for visually impaired people. With more than 20 million people in the U.S. alone who are affected by vision loss and numbers growing, there is a rising demand for low vision aids such as a video magnifier. Electronic low vision devices allow people affected by an eye condition such as Diabetic Retinopathy, Glaucoma, Macular Degeneration or Retinitis Pigmentosa to still live independently. 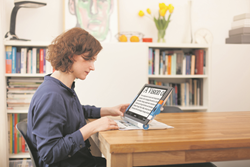 The Optelec Traveller HD has been developed based on the feedback received by people with low vision. "Our customers requested a video magnifier that has a large screen, but is easy to transport. The Traveller HD bridges the gap between current desktop and portable models. It is the first video magnifier that is small enough to take to school, office and on vacation, yet its screen is large enough to comfortably read letters, magazines and newspapers." Maarten Bosch, CEO of Optelec stated. Aside from its unique Slide & Read mechanism and portability the Traveller HDs ultra-bright 13.3 inch widescreen carries another benefit. “The large bright widescreen not only displays text in sharp magnified images and higher contrast, you are also able to read in any lighting condition, even bright sunlight!” Stephan Terwolbeck, President Optelec U.S., added. The Traveller HD offers stepless and variable zoom, with adjustable magnification starting at 2.4 times and allows users to see smaller details of photos and text on the 13.3-inch widescreen. The large screen slides smoothly across a line of text and displays magnified words on the screen. Sliding back and forth enables users to recognize the shapes of individual words making it easier to read, plus it provides a more natural reading experience for people who have difficulties keeping a steady hand. The large screen smoothly slides across a line of text and displays magnified words on-screen. Sliding back and forth enables users to recognize the shapes of individual words making it easier to read. The Traveller HD will be available through Optelec’s Authorized Dealer and distribution networks. Call 800.826.4200 or visit http://www.Optelec.com for further information. Optelec enables those who are impacted by vision loss due to retinal eye diseases such as Age-Related Macular Degeneration, Glaucoma or Diabetic Retinopathy, to remain independent and enjoy life, by reaching out with simple and effective low vision and blindness solutions. Based in the United States, Canada, Netherlands, Belgium, Germany and the United Kingdom, Optelec is the leading distributor, designer and manufacturer of life-changing assistive technologies for people who are visually impaired and blind. Optelec continues to be the global front-runner with a multi-tier distribution in more than 70 countries worldwide. With US headquarters in Vista, CA, Optelec offers a nationwide network for product solutions and low vision rehabilitation. Please visit us at http://www.Optelec.com.